Are you ready to put your money baggage behind you so that you can build financial freedom and finally succeed with money? You will completely transform your relationship with money and open your bank account and love what you see. Maybe you found some great insights and awareness about your current financial situation through the Financial Roadmap course, yet you’re still not convinced all of your money problems will magically disappear. · How long are my money problems going to last? · Will there ever be enough money in my life to do the things I want without constantly worrying about my finances? I too had these questions for a long time in my life and business. It inspired me to understand why we do what we do with money and what keeps us from living a life of financial independence and freedom. When you get right down to it most money problems have nothing to do with money. 1. Do you have the identity and beliefs to match the financial goals you have? 2. 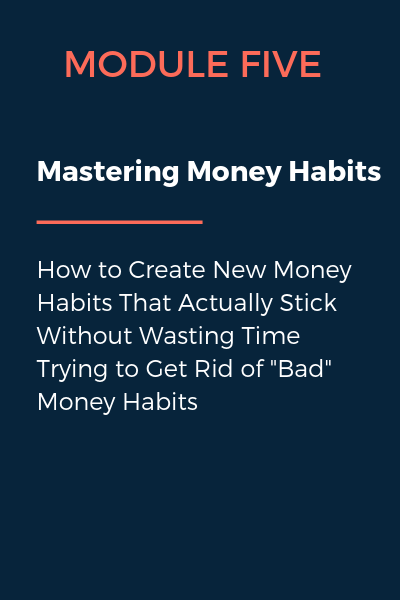 Do you know what your money habits are and how to change them? 3. Do you have systems for your money that help you reach financial independence? You are experiencing what you are experiencing with money because you are in the habit of it. Your financial life is being run on autopilot. Your financial goals require a completely new way of being and experiencing money. You can continue to try and change by chance or you can make financial changes that stick by choice. When you change the internal experience around money, you change your outcome with money. Who you are with money and how you see yourself with money is more important than money itself. You have to give up parts of who you are to become who you want to be with money. This program promises to show you exactly how to overcome and transform your relationship with money from beginning to end – to hold your hand through the process until you have a new and healthy relationship with money. Working on your relationship with money can be an emotional rollercoaster and having a safe, trusted guide walk you through the process not only helps keep you accountable, but allows you to be seen and heard maybe for the first time around money. You will align your money identity with your dream financial situation. This program promises to teach you all the elements of my money identity transformation. Finally, you will connect and integrate your new money stories and beliefs into a money-making AND money-keeping. Limited to 5 people, $99 deposit waived! Unravel your subconscious identity that’s running the show. Who you are with money and how you see yourself with money is more important than money itself. The story we tell ourselves about money is the root of most of our money problems. It takes more than just a little self-talk and affirmations to change these long-held beliefs. When you understand the underlying drivers of your behavior you can start to use them more effectively to get what you want. Understanding what causes you to move into action is important if you want to succeed with money. When you change your current programming and conditioning, you change your outcomes. Making new key decisions can ultimately change the course of your financial life. Your financial life is perfectly designed to keep you exactly where you are right now. The results you get in your business are because you are in the habit of it. You affect change by changing your daily habits. Financial freedom is found in systems. Setting up systems for how you make, keep, and grow money in your business and life is essential for financial success. 6 LIVE Q&A VIDEO CALLS - Get all your questions answered throughout the course of the program. I will help keep you accountable and help you move past any blocks you experience. ACCESS TO THE FINANCIAL ROADMAP COURSE - The foundation course that helps set you up for financial success. From financial goal setting to planning your financial year, it's all there! LIFETIME ACCESS TO THE PROGRAM CONTENT AND UPGRADES - Never worry about losing access to the program with lifetime access. Including all program updates. ASSESSMENTS - How you respond to expectations around money, what motivates your money behavior, your current financial comfort zone, and more! Lifetime Access to the Course - Never worry about losing access to the program with lifetime access. Including all program updates. 12 One-on-One Private Coaching Calls - You will get 12 one-on-one private coaching calls each month to customize the program to your specific financial situation and goals. Includes (2) 45-minutes calls per month. Limited to 5 People- This option is application based and once your application is accepted we will book your first call after March 4th. Each Module has a specific topic that we will cover through video lessons and companion workbook. Each Module will be covered over the course of a month with weekly videos covering the specific monthly module topic. This makes the content easy to learn, digest and to integrate with exercises. The next Succeed With Money Transformation Program begins Monday March 4th, 2019. In the meantime, once you join, you will continue to have access to the Financial Roadmap course material. I will send you an email with your login and password information to continue to have access to the Financial Roadmap course. How will I be able to access the content? You will receive an email with login and password information to gain access to the course. Make sure you whitelist emails coming from hello@christinewilborn.com to assure you get all the information and updates regarding important details about the course. Is there a pay in full option? If you would like to pay in full you may email me at hello@christinewilborn.com and I will personally send you a payment link to pay in full. For Option A: On You Own it will be $997.00. For Option B: Do It Together it will be $3,000.00 pending application and if there are still spots available. Ready to Succeed With Money? Let’s Do This!